Let's face it: We tend to do or buy what other people are doing or buying. If voice of uniqueness inside your head protests, ask it why did you join Facebook? What about the last movie, book or game that your friends recommended? And that's not a bad thing after all. In a risk of stating obvious, we are overwhelmed with information and having "filters" in form of friends recommendations help us not to sink. 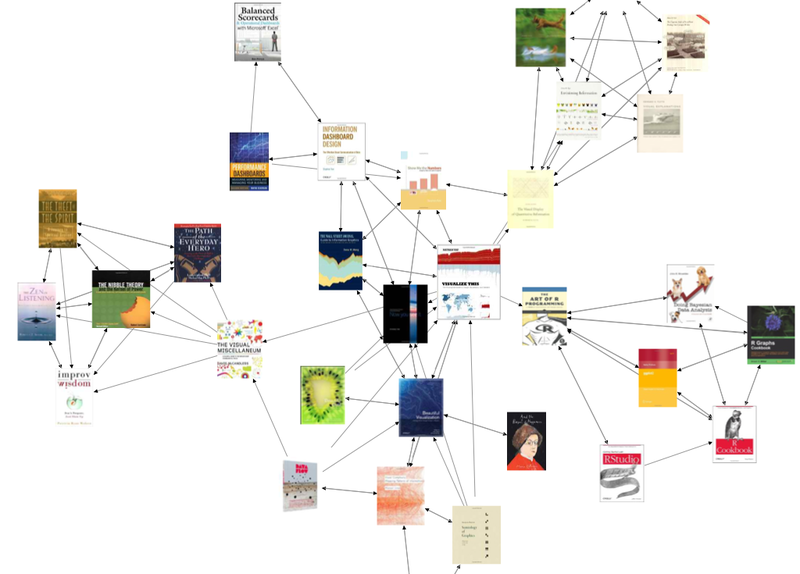 Diagram above shows customers preferences for the data visualization books. Each link on the diagram means that two books are often bought together. To find the most popular book all we have to do is count number of connections. The most connected product is most frequently bought with all other products in the domain, hence there should be a reason. In the diagram above such product is book by Nathan Yau "Visualize This". Why is it so popular? That's for me to not know and for you to find out. Maybe it's a good marketing campaign or maybe the product is astonishingly good. Let's say you are in situation when you have to study a new field. What do you usually do? You ask an expert (if you have one in your circles) what is a good starting point, or you google a lot, read reviews and make a decision what to read. With Yasiv you do exactly the same thing but much faster. Just type a search query and find the most popular book in the area. Chances are it's the one recommended by experts to other learners, who actually bought it. Yasiv uses Amazon's database of products and purchases. In 2010 Amazon.com had in net sales 90 million dollars every day. While you were reading this article Amazon has sold goods to the amount of $150 000. And all this information is available at our disposal. Yasiv takes it and transform it into more consumable format. Try it yourself: http://www.yasiv.com/amazon - type in your favorite book name and decide whether believe it or not. If you like Yasiv, please let me know. If you don't like it - go away. Nah, just kidding. Of course share it with me. Your feedback is very welcomed on this blog :). This is a great tool and a pretty decent visualization. I'm trying to see if I can incorporate it into a brief study on amazon search results; however, collecting the results from multiple participants would be difficult. for example, right now they would have to print screen and manually time stamp. If one could make a request, it would be great if users could submit their results with a time stamp to an email. Even just as a table with link node relationships outlined. Hi Adeel, could you elaborate a bit please? What are you trying to do? Can you give an example? que tan complicado es que pueda implementarlo en mi sitio?